Hydroculture is the science of growing plants with no soil or peat mix involved. Using water-tight planters, the plants are located firmly using 'leca', a light, sterile and porous clay bead which acts as the planting medium. The roots of hydroculture plants are thick and succulent in marked contrast to the thin fibrous roots of soil grown plants and by using a specially formulated plant food rich in essential elements and micro nurients we can ensure health. The result is that hydroculture plants absorb nutrients directly from the water/leca in which they are grown. Smaller root systems are developed so that plants of impressive height can be grown in relatively small containers. 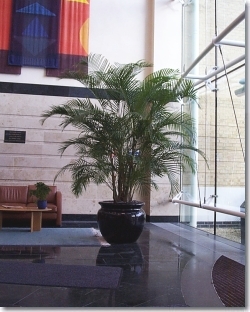 Decorfolia has made a speciality of supplying plant displays using this method of culture. Did we hear you say why? A more accurate watering regime is established. Routine servicing is simpler, cleaner and more reliable. Servicing is only required once every month which is more cost effective for our clients. The sterile clay granules give no shelter to small insects sometimes found bothersome with soil based plants. Peat areas around the world are a valuable natural resource that is rapidly being overworked. We believe that hydroculture is a greener method of plant culture.